Captain Brian Perkins served 30 years in the U.S. Coast Guard in the prestigious assignment as Chief of Cutter Forces for the U.S. Coast Guard. As one of the founders of Coast Guard Cuttermen’s Association, it was Captain Perkins’ vision to align the Cuttermen’s Association with the Surface Navy Association. Creating the value-proposition and selling the concept to both organizations, this alignment and merger was accomplished in January 2016 to the betterment of both organizations. For the past eight years Dirigo Strategies, LLC, has provided targeted consulting advice to U.S. and overseas medium and large-sized companies seeking to sell marine products and services to navies, marines, and coast guards in the U.S., Canada, and Scandinavia. 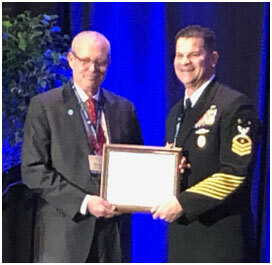 Current products represented include coastal vessel traffic and information management systems, military radars, heavy weather davits for launching boats, hull stress monitoring systems, amphibious Arctic crawlers, and environmentally friendly bio fuels and by-products. Dirigo Strategies is a member of the Maine International Trade Center (MITC), Marine and Oceanographic Technology Network (MOTN) and the Greater Portland Regional Chamber of Commerce. We also work with PTAC, Tech Place and SCORE.